A recent participator to the International Milling Directory‘s sister magazine, Grain & Feed Milling Technology (GFMT), recently showed a product review by an exciting company involved in many areas of animal feed – Orffa. This may seem an odd blog post for our regular readers as Orffa have not registered to the International Milling Directory yet. We are keen to bridge the gap in awareness between the International Milling Directory and GFMT as the different publications are excellent complimentary partners for our members and advertisers. The 22 year history of the International Milling Directory, combined with the 122 year history of the International Milling Directory makes for a substantial brand recognition and high levels of readership to add value to your advertising, investment and listing with us. Register and update your listing for your organisation now at the International Milling Directory. Free and paid options are avaliable for a short time in order to be in the new edition for 2013/14! We were visited early on the opening day of IPPE by Carlos Carlos Cesar Pavesa, director and CEO of Engormix, the Latin American online news service for the feed industry. ‘Directory’). The app is completely free, just use your touchscreen device and save it as an app to your device’s menu. Overall, official press releases from IPPE today describe that it exceeded its expectations with more than 25,000 poultry, meat and feed industry leader attendees from all over the world. In addition, the show had 1,189 exhibitors with more than 430,000 net square feet of exhibit space. Final numbers will be released after the registration database has been audited for duplications. Sponsored by U.S. Poultry & Egg Association, American Feed Industry Association, and the American Meat Institute, IPPE is the world’s largest annual poultry, meat, and feed industry event of its kind. “We are extremely pleased with the number of exhibitors and attendees on the exhibit floor for IPPE. We have had a great turn-out this year, and the energy and excitement on the floor has been apparent all week,” remarked the three trade associations. The central attraction was the large exhibit floor. Exhibitors presented the latest innovations in equipment, supplies, and services utilised by industry firms in the production and processing of poultry, eggs, feed products, and meat. Many companies use the annual event to highlight their new products. All phases of the poultry, feed, and meat industry were represented, from live production and process events at IPPE. Dr Mian Riaz of Texas A&M University, a contributor to both International Aquafeed and Grain &Feed Milling Technology, visited our stand on day two to meet with Roger Gilberting to further processing and packaging. An expanded education program complemented the exhibits by keeping industry management informed on the latest issues. This year’s educational line-up featured 15 associated conferences at the event, ranging from an antibiotic conference on current issues for the poultry and egg industry to an international feed education program to international regulatory topics for meat. The College Student Career Program attracted more than 400 students from 26 universities throughout the United States, while the new International Student Career Program brought in 13 students from four countries. The graduating students interviewed for jobs and internships with 93 human resource representatives from 28 industry and allied firms. They were also able to visit the exhibit floor to see the most current technology used in today’s poultry industry. Other featured events included a Tech XChange programme, the International Poultry Scientific Forum, Meat Me in @LANTA activities, publisher-sponsored conference programmes, and the Pet Food Conference, all of which made the 2013 IPPE the premiere annual feed and protein event of the western hemisphere. The International Milling Directory now looks ahead to the next relevant event, GEAPS Exchange 2013 which coincidentally is also in the US. It will take place from Sunday 24th to Tuesday 26th February. Despite the short-lived tornado that struck the Georgia World Convention Centre around midday on day two, it was already evident that the addition this year of the American Meat Institute (AMI) to form a triumvirate of processing organisations with the AFIA and the US Poultry and Egg Association to form the new International Production and Processing Exposition (IPPE), was already on the way to a great success. The show sees the filling of both Halls A and B to capacity at the Georgia World Congress Centre and the visitors had much to see and do despite the odd bucket that had been strategically placed to catch drips from leaks in the roof. After an initially quiet first morning for IPPE, the end of day one and the morning of day two proved very popular. Exhibitors enjoyed a steady flow of guests with the crowds being more diverse than last year in our view, and with a healthy stream of Latin American and African visitors to the stand. While meat and poultry exhibitors were presented in either the live production and processing, live production or live poultry production areas; feed-related exhibitors maintained their own section of Hall A and drew together ingredient, equipment and other suppliers. We hear the numbers in Hall A was a great reflection of the diversity of feed, milling and equipment technology! The purpose of the show for us is to showcase the current International Milling Directory and other publications yielded a great deal. Perendale has been fortunate enough to have a team of three staff from the Headquarters in Atlanta solely for the event. The International Milling Directory was well received as was the Spanish-language editions of both Grain & Feed Milling Technology and International Aquafeed. The final trilogy of the event is today, day three of three is here: the final trilogy of the event is today. At stand 1700 in Hall A2 will be your final opportunity to see and discuss our products, services and publications can do for you and your organisation. The International Milling Directory congratulates the organisers on a great event and looks forward to next year’s offering. We look forward to the feedback, reviews and new emphasis for our responsibilities with the International Milling Directory in 2013. I expect the drive and commitment to be focussing more on our users, members and advertisers in producing and publishing the International Milling Directory for the next 6 months. I hope you enjoyed this blog’s daily updates this week for IPPE! 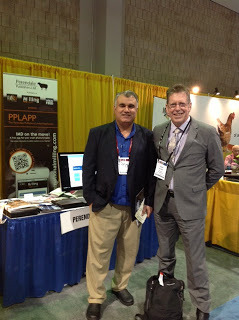 The Perendale Publishers International Milling Directory team are in Atlanta, USA this week for the IPPE show. On Sunday the team set up the stand as the site was already a hive of activity with people keen to see the latest food and feed developments. Day 1 got off to a good start and the stand is looking marvellous. One of the first visitors was Carlos Cesar Pavesa, director and CEO, Engormix (pictured below with Perendale’s Roger Gilbert). Roger (Perendale Publishers, Stand 1700 in Hall A2) is visited early on the opening day of IPPE by Carlos Carlos Cesar Pavesa, director and CEO of Engormix – the Latin American online news service for the feed industry. It is in fair Atlanta where we lay our scene today…Day 1 of the International Poultry and Processing Exhibition (IPPE) is here! Day 1 is here– visit the International Milling Directory (IMD) at stand 1700 in Hall A2! Do visit Perendale Publishers for the up-to-date information and contact details for 2013/14 IMD media kits today:- stand 1700 in Hall A2. International Milling Directory at the imminent IPPE! 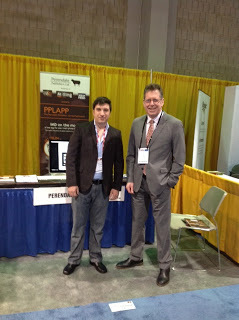 The International Milling Directory, as part of Perendale Publishers, is attending IPPE this week. News back from our three colleagues is that they have arrived safely in Atlanta and will be setting up the stand and preparing for the show’s opening day tomorrow. Many of the International Milling Directory‘s members are also exhibiting which will be an exciting opportunity for meetings and networking. Stop by at stand 1700 in Hall A2 from tomorrow (Tuesday 29 January) through to Thursday (31 January) to see the International Milling Directory, Grain & Feed Milling Technology magazine and the International Aquafeed magazine, plus our other publications. Do come and see why our publications connect the feed industries with the right audience, and of course, to find out all about the new 2013/14 International Milling Directory! The field of software and ICT in agriculture is a growing field. From afar it seems an inevitability that agriculture is like any other business that relies upon everyday.It probably seems that it does take a long time for its implementation in all worldwide agriculture, logistics and supply chain markets. 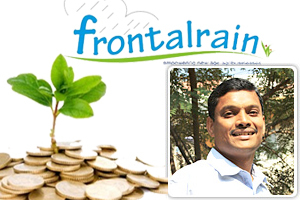 FrontalRain Technologies joins the International Milling Directory today and we are proud to add new listed companies in the ‘Consultants – Computer Systems’ listings. Mr. Sreeram. P is the registered and contactable person for FrontalRain systems at the listing on The International Milling Directory. I look forward to creating a good relationship to retain the Yaşar Group in the IMD for many more years to come. Register now and update your listing here! Today there is a new effort at Perendale to create synergy and integration between the different publications. We are trying this by including the International Milling Directory (IMD) in Grain & Feed Milling Technology‘s (GFMT) blog and plan to increase this into a column in the magazine issues. There has been a gap in some IMD and GFMT’s members and readers being aware of the other publication and we are aiming to feature the work and good features of both as they do have such similarities; they also have different purposes and benefits to participating. Today we have a guest blog post from Tom Blacker from Perendale Publishers. Tom has taken on the challenge of coordinating the International Milling Directory (IMD) for 2013/14. Although he’s fairly new to the company, Tom has fully immersed himself in all thing IMD and the next edition is shaping up to be bigger and better than ever. Grain & Feed Milling Technology and the International Milling Directory (IMD) are normally separated by the different purposes and also by the building’s walls here at the Perendale offices. As it will be myself coordinating the new 2013/14 directory for publication and print later this year, it is good to welcome you in to 2013 with a renewed focus for the IMD too. Foremost on the horizon is my first conferencing for the International Milling Directory at GEAPS Exchange in Louisville, Kentucky, USA in just over four weeks. IMD will be at the Perendale exhibition stand and will be distributing copies of the current edition to attendees and participants.The GEAPS show is for the grain handling, elevator and processing industries and is a very long running conference. I am going to be a new face but aim to be able to attract the same levels of productivity as the old hands who have been before. Many of the IMD’s member companies and organisations will be present, especially from the US market. Large and smaller companies are exhibiting and the single hall plan means all will be easy to reach. I am personally excited about the opportunity to interact and promote the IMD as well as Grain & Feed Milling Technology to this conference. Falling in February, after IPPE, will hopefully give a refreshingly compact approach to a US conference. Around 500 stands have been booked in total for GEAPS Exchange so far. Do come and check out the IMD and myself at the Perendale Publishers’ stand next to the main hall’s entrance doors. Ivan Marquetti, Perendale Publishers’ Latin America manager, is due to join me for GEAPS Exchange so I also look forward to working together with him at this event. Don’t forget, you can access the IMD online here. Another new company signed up to the International Milling Directory: Personalized Nutraceuticals. This Italian company produces raw material feedstuffs and premixes for animal feed. Their products cover just about any chemical and nutritional element for animal feed. 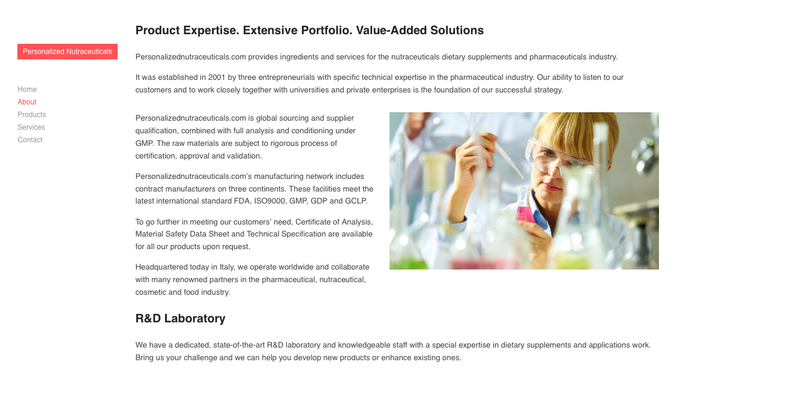 Also, their R&D laboratory has “[…] special expertise in dietary supplements and applications work […] we can help you develop new products or enhance existing ones” which shows the true meaning of ‘personalized’ in the organisation’s name. Personalized Nutraceuticals are a new addition to this year’s International Milling Directory which gradually increases our scope and breadth to maintain our position as the largest and most widely distributed printed milling directory. Register here to ensure your place in this year’s directory!